This cake is much easier than it looks. You can take any flavor cake mix and combine it with any frosting of your choice, add an interesting filling and top it with your favorite candy pieces. This one is obviously, snickers candy bars. I use the small snack sized squares and cut them in half. I prefer dark chocolate fudge cake mix. Take two boxes, mix according to the directions on the box. Bake two of them in two 9 x 2 round pan. Cool completely before adding frosting or filling. I make the filling for this cake. 1/2 a 12 oz jar of Peanutbutter (crunchy or smooth, your preference) and 1 can of buttercream frosting. Mix with mixer and spread over bottom layer, using all, it will be thick. Place top layer on the filling and frost with two cans of Milk chocolate frosting. 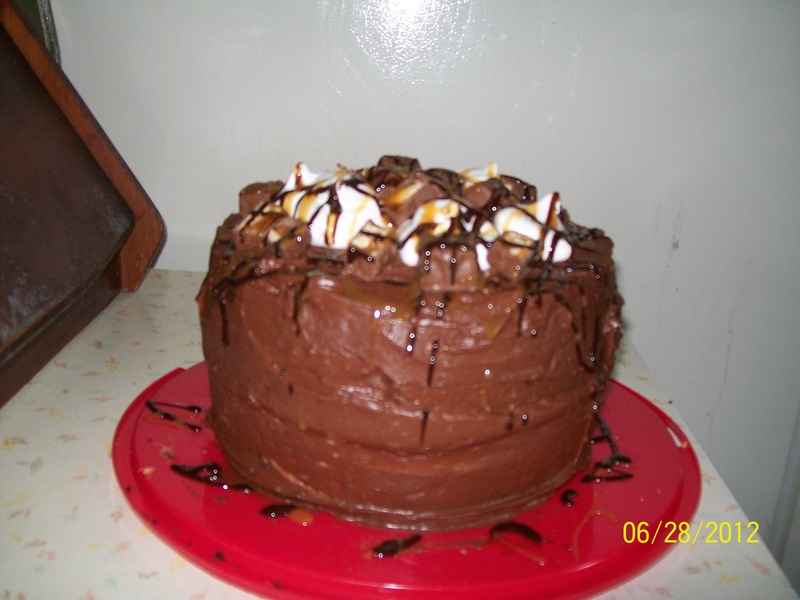 I decorate the top with the snickers, cut in half and then drizzle carmel and hot fudge topping over it all. (this is just ice cream topping). In this picture there are white puffs on the top, those are a white fluffy frosting (Betty Crockers fluffy frosting mix) but not necessary unless you want to add this. Like I said, you can do this with just about any candy. I made one for a friend, who loves almond joy. The filling was vanilla frosting, a couple of drops of coconut flavoring, mixed thoroughly with a mixer, and of course, half a bag of shredded coconut. I topped it with almond joy candy bars and chocolate covered almonds. a sprinkling of coconut on the sides made it look delectable! Homemade Potato Soup! nothing better on a cold wintery day! Easy to make and yummy to the tummy! 5 large potatoes peeled and diced. 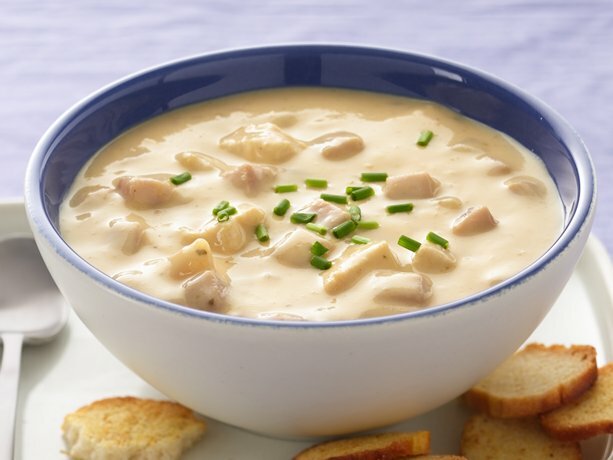 1 pkg instant onion soup mix. place both ingredients in large pot add enough water to cover potatoes and boil. while potatoes are boiling, in a small mixing bowl add 2 cups of regular flour. make a “well” in center and add two whole eggs slightly beaten. mix with fork. mixture should be fairly dry and crumbly. should not hold together…..these are the rivels …when potatoes are fork tender but not mushy, add about 2 cups of diced ham, more or less to your preference, then add the dry ingredients and boil at full boil for about 3 minutes, til the rivels are done, they will be cooked through and not mushy. If the mixture in the pot thickens too quickly, and is in risk of burning, add more water. Just enough to keep it a soup consistancy. when cooked, remove from heat and add enough milk to make the desired consistancy. I normally add about 4-5 cups or more. depending on how thick the soup is and how thin I want the soup to be. you will know as you stir the milk in. once you make this and see how easy it is, and how good it is, you will see this is a “keeper”! These are to die for!!! I use Idaho potatoes for the most flavor. Wash, scrub and peel about 10 large potatoes. Dice them and put them in a large pot. Add just enough water to cover the potatoes. Bring to a boil. reduce heat to med. high and boil til tender. Once you can easily mash them with a fork, remove from heat. Do not pour off all of the water. Keep about 1/2 of the water. 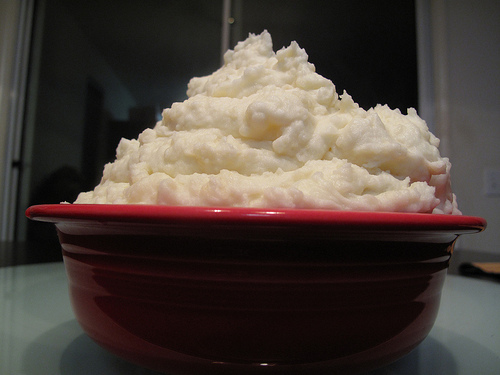 put water and potatoes in a large bowl and use a mixer to mash them completely. add about 1 tbs. of coarsely ground black pepper. add 1 stick of real butter. it will melt while you beat it into the potatoes. Now turn the mixer on high and whip the potatoes til they are smooth and creamy. The secret is using the water you boiled the potatoes in. This is where alot of the flavor is lost when you throw it out. And the black pepper adds just enough to bring out the flavor of the potatoes. You can add milk if you like but you really don’t need to. A favorite with my family. 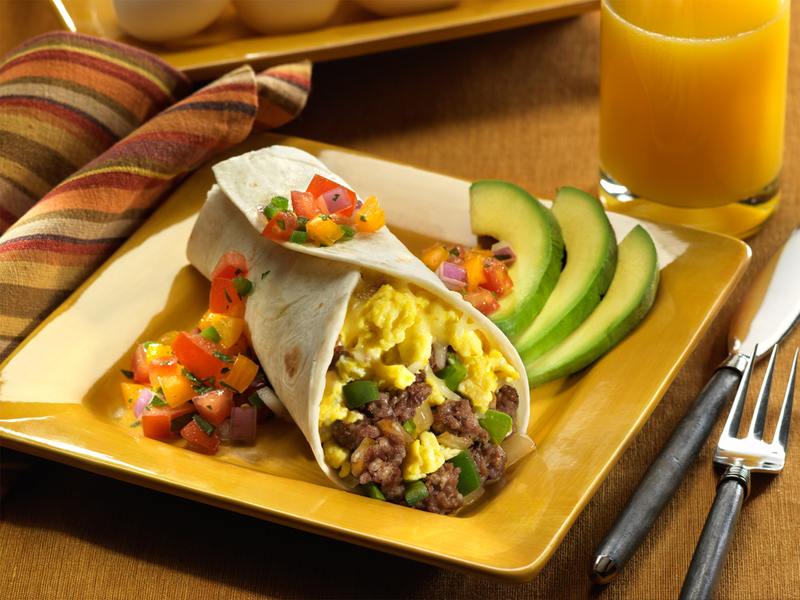 1 pkg of 8 burrito wraps. I use white flour ones. 1 lb roll sausage, your favorite kind. 10 large eggs, scrambled. 1/2 a green pepper chopped, and 1/2 a large sweet red pepper chopped and 1/2 large chopped sweet onion, saute all 3 in butter (about 4-5 tbs. ) til tender. 1 8 oz. bag shredded mexican cheese. not the one with the spices but the one with the four different cheeses. Salsa. Of course homemade is best but if you don’t have homemade, then get your favorite. You notice there is no heat in this. You can use spices when you make the sausage, I never do though. Or You can use hot pepper cheese. And You can use the salsa to spice it up. And of course you can always put hot peppers in with the green and red sweet peppers. I keep mine fairly mild and let each person spice it up with an offering of mild, to not so mild salsas. I heat the wrap one at a time, in a heated skillet with a little melted butter. As it heats I put a generous amount of shredded cheese on to melt. This only takes less than a min. to heat up the burrito shell. You don’t want it cooked. Don’t worry if the cheese isn’t melted, the heat from the meat will take care of that. Now take the shell from the pan and place it on a plate. Take about 1/4 cup cooked sausage, still hot from the pan, and place it in the middle, spreading it out lengthwise. then do the same with the green and red peppers and onions. add more cheese and begin at the bottom. The bottom is the part nearest you. Fold about 1/3 of it over the top and then take one of the sides and fold it over then the other side, folding it over the top. Garnish with some sour cream and salsa, sprinkle a little more cheese on top. Ok so maybe not just like gramma used to make. I cheat and buy the Bob Evans Frozen Biscuts. Or something similar. Just bake according to package directions. But the gravy is homemade. Here’s how…. 1 lb roll sausage. Cook it over med/high heat til thoroughly browned, add about 1/3 tsp freshly cracked black pepper. If the sausage is very lean, you will need to add some fat. You can use butter, olive oil, shortening, anything you want, just so it is fat. You want no more than a few tbs of added fat. Then add about 3-4 tbs flour, keep cooking and stirring til flour is lightly browned, reduce heat to med. Then add about 2 cups water, constantly stirring. When mixed with flour, add about 3 cups of whole milk. reduce heat and simmer. stir often. once thickened, if too thick add more milk, if not thick enough continue to cook til it is. 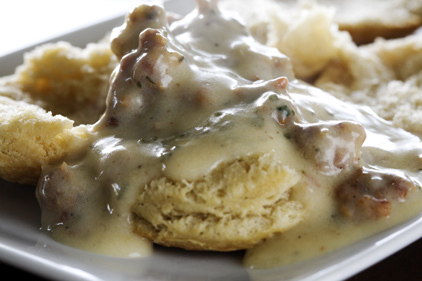 Spoon over biscuts. This looks more intimidating than it is. Just bread and eggs. Slice up some fruit, use what you like. I love berries so most of the time I use strawberries and raspberries or blackberries or whatever other berries I can get my hands on, depending on the season. If you like peaches, mangoes, mandarin oranges, then go for it. 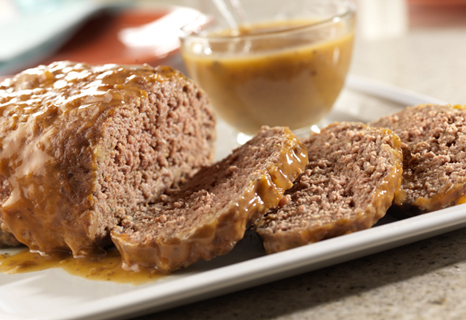 The sauce is wicks pie filling and glaze. You can get that in many flavors. I prefer the strawberry, but I know they have peach too. Now for the french toast itself….. easy. For every 4 pieces of bread, use two or three eggs, depending on the size of eggs and the size of bread. I use texas toast or sliced french bread. I also use regular sandwich bread. 3 extra large eggs beaten, about 3 tbs your favorite brand liquid flavored creamer. use your imagination. I use french vanilla most often. however the cinnamon vanilla is really good. Look at what is out there. During the holidays, you can get some really good stuff. Try the egg nog flavored creamer, or the ginger bread, or the white chocolate with raspberry……. well you get the idea. Pre heat a skillet on medium heat and melt about 1 or 2 tbs real butter in the skillet. place each piece of bread into egg mixture, covering the whole slice. Give it a min to soak up some of the flavor and then put it immediately into a preheated skillet, (on med. heat) . When beginning to brown on the bottom, (about 3 min or so) turn over til slighly brown on both sides. 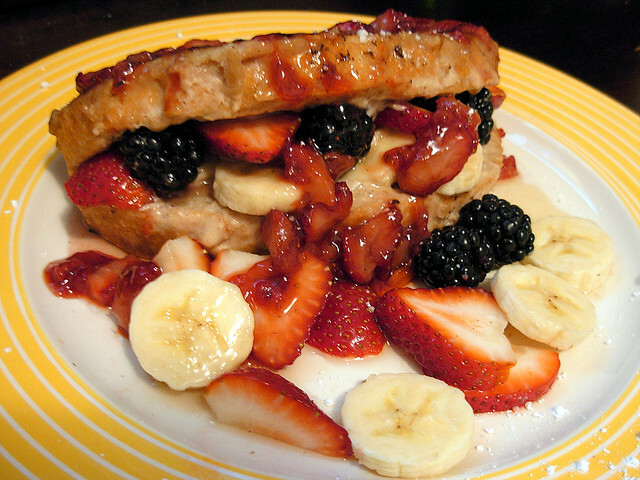 Place one piece on a plate and add fruit and glaze mix, then place the other piece of french toast on top. sprinkle a little powdered sugar over it if desired. I like a little french vanilla cool whip.